… which, after close scrutiny, is due to Microsoft having failed to fully QA the new release by omitting to test it at all on any Mac with a case-sensitive filesystem: The new update is linked against ‘USBHidWrapper.framework’, whilst the framework is actually named ‘USBHIDWrapper.framework’. Very unhelpfully, Microsoft also remove all previous downloads for a given product when a new update is released, so it’s not possible to revert to the (working) 14.0.6 release. Very disappointing. Especially since this update has been live for seven days now, and no revision has appears to be forthcoming. … which is the minimally-invasive fix for the issue, and doesn’t seem to cause any app-signing issues. Since coming back from Christmas Holidays, Lynx is now refusing to start. Initially, it would launch and then abort before opening a window. Sometimes this would be accompanied by Microsoft Error Reporting appearing but being marked “Application Not Responding”. But it still didn’t affect the Lync crash I’ve been having. As above I found that, with the above work-around (which Microsoft *still* haven’t fixed the need for) Lync worked on my Mac from December until Christmas. Returning in the new year, Lync instead crashed on launch – but with, instead of an Apple crash dialog, a Microsoft Crash Reporter window. This continued for about two weeks, when – with no change from my end – Lync would again connect. However, my messages weren’t delivered until recipients unless they’d first sent me a message, my typing status wasn’t visible to others, and only about half the messages I sent were received when then. After three days, this fixed itself (without even restarting Lync) and it worked properly again. It is notable that – before, during, and after this whole period – Pidgin with the SIPE plugin was signed-in to the same account and never missed a beat. 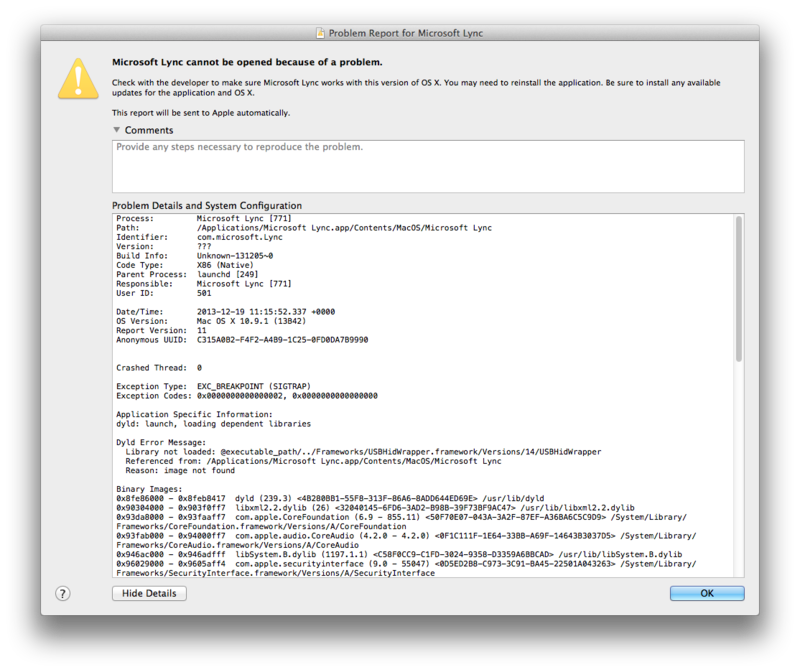 I reboot in the middle of last week has resulted in the Microsoft Crash Reporter when launching Lync ever since. For a enterprise-targeted piece of paid-for commercial software, this is entirely unacceptable. 4 months after release, this problem is still not fixed – Lync on Mac OS with a case-sensitive filesystem is essentially non-functional, and even with the fix above it appears that Lync will only actually work one reboot in three. Quite what changes over reboots I have no idea – but this does appear to be relatively consistent. I’ve been using Pidgin which, unlike Microsoft’s product, is able to connect to Microsoft’s Lync servers reliably. Unfortunately, work has not transitioned to a heavy reliance of Lync Phone for conferences and calls, and I’m not aware of anything else compatible with this. Today I got a notification that Lync 14.0.8 has been released (although the About window still says “©2010 Microsoft Corporation”…) – and this still has the USB framework case bug. FWIW, Lync 14.0.10 still has the problem — and the fix presented here still works.